Often people will ask or wonder, other than the Bible, what are the best book(s) I should read regarding my faith. I have a new answer I wish I would have known about years ago. 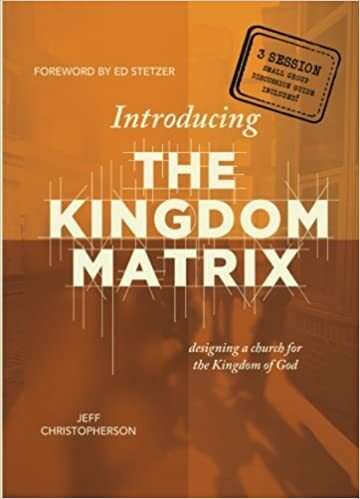 Kingdom Matrix by Jeff Christopherson just might be the most powerful book to wake modern Christianity and Christians up from the deep malaise we have been in for many generations. I have often felt we are on the cusp of another Great Awakening type event within Christianity and if I had to throw my small potato’s weight into the mix, I would say the widespread reading and implementation of Kingdom Matrix within local church bodies is going to be the catalyst to launch another widespread revival. The author was a speaker at a Pastor’s Conference in Atlanta and the way of viewing the Church and our role within our surrounding community resonated. This was how I always envisioned “church” operating, but had never really seen put in place within the scope of reality. Jeff described how they did it and it is being done in other places and I was hooked. I highly recommend this book for all Christians. It will change the way you implement your faith as most of us are doing it quite poorly. Good luck and let me know how the book impacted your faith and changed your world view.